Hi all! We are in a mad rush to finish wrapping presents and leave to visit my family but I wanted to take a minute to let you know that my Quilt Club pre-sale offer expires tomorrow evening- 12/24/14! 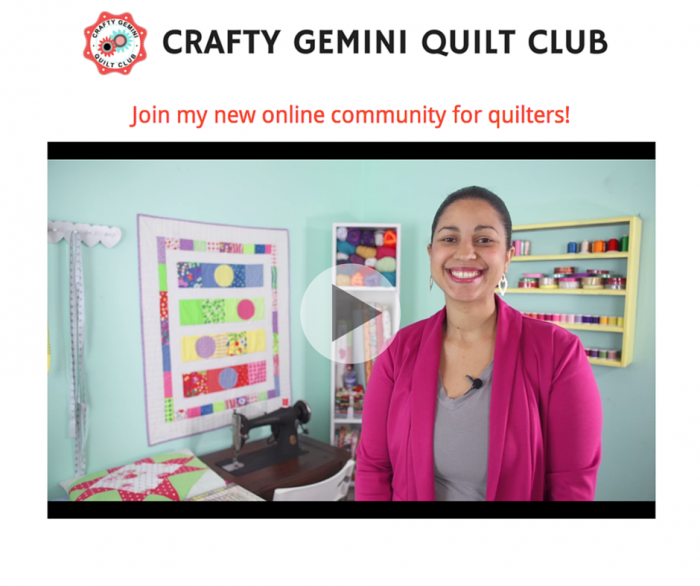 I started accepting members into my Crafty Gemini Quilt Club on Friday and in just 4 days we have over 360 members signed up and ready to have some quilty fun!! 2015 is going to be so much fun! If you’re not on my email newsletter list then you probably have no idea what I’m talking about. Well, just to recap…I’m launching a new online quilting community in January and am currently accepting members at a discounted rate until 12/24/2014 at 11:59pm EST. This is only the pre-sale offer and after this opportunity expires tomorrow night the price will go up! Get this as a gift to yourself! It will be worth it. My Quilt Club is for anyone who loves to quilt or wants to learn! I will have a full beginner video series just for newbies. We are also going to have online course videos, tips & tricks videos, weekly live video streaming chats, a Block of the Month Mystery Quilt, swaps and so much more! We haven’t even officially launched yet and members have already started chatting and getting to know one another in our Club Quilter’s Forum. Don’t miss out! To learn more about my Quilt Club and the pre-sale offer CLICK HERE to watch the video that describes everything in detail and includes the sign up links as well. I’m off to wrap some more gifts before we leave town for a few days. Let me know if you have any questions about the Quilt Club. Hope to see you in January! CLICK HERE TO JOIN MY QUILT CLUB! You will be able to access the chat function on an iPad but you will have to download the app first. Thanks. It seems that you’ve thought of everything. Thanks for answering my questions. I feel better about it now. I like to know what I’m getting into. Looks like you’ve got your work cut out for you! I love reading your blog and receiving your emails. Thank you so much for all of the wonderful tips and tricks. I have learned so much. I was wondering if we will still have access to your blog, videos, etc… like we do now or will we have to join your club to continue receiving your info? All my current content will continue to be free. I will also continue to upload free content just as I have been. The Quilt Club is a separate venture. Just came across your club, can I still join and what is the price? Hey. I signed up for 1 month of the quilt club but my pay pal acct got charged for recurring billing. How do I change it to 1 month? I joined at the discount rate but I cannot find a confirmation e-mail. Hi Violet! I just resent you a welcome email with a new password to login. Check your spam/junk folder too in case it ends up there. Thanks! Is it still possible to join this? Hi Sandy. Thanks for your interest in our quilt club. Unfortunately, the quilt club is no longer active or accepting members.